Jenner is an experienced veteran with the media. 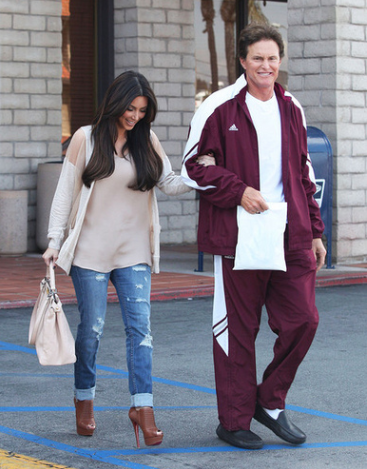 He took home the gold medal in the decathlon at the 1976 Summer Olympics, which earned him the title of “World’s Greatest Athlete.” After his first two marriages and the birth of four children, he said his “I do’s” with Kris Jenner in 1991 and became the patriarch of the Kardashian-Jenner clan. With Kris, he had daughters Kendall and Kylie Jenner, and he became stepfather to Kourtney, Kim, Khloé and Rob Kardashian. Jenner entered the media spotlight again when the family began filming their reality show, “Keeping Up With the Kardashians.” However, throughout the past few months, he’s been in the spotlight for reasons of his own: rumors about his gender. Bruce said he has known about his gender confusion since he was 8 or 9 years old, when he decided to try on his sister’s dress — and he felt good wearing it. He kept this a secret for much of his life and tried to turn his focus away from his inner struggles by training diligently for the Olympics. His feelings, however, did not subside for long — he confided in Chrystie Scott, his wife at the time and the first person to know about his gender identity confusion. When he was married a second time to Linda Thompson, he told her as well, which seemed to have been a large catalyst in his second divorce. In the 1980s, Bruce Jenner was having such a hard time living life as a man that he began making the change to a woman by taking female hormones and enduring hours of electrolysis, eliminating his facial and chest hair. He went off the hormones after five years to avoid media scrutiny, and shortly after, he began his relationship with Kris. His 23-year marriage to Kris ended in 2014. Jenner admitted to Sawyer that Kris has seen him in a dress before, but that he would brush it off and tell her he simply enjoyed cross-dressing. Time passed, though, and as fearful as he was, he eventually revealed his deeper secret to the rest of his family. Kim Kardashian was the first of the Kardashian/Jenner girls to know about his being transgender, and Jenner said in his interview with Diane Sawyer she has been “by far, the most accepting.” Khloe, who is known as the fun-loving and accepting sister, is surprisingly having the hardest time with Bruce’s transition. Nevertheless, the rest of his family is very compassionate toward this new chapter in his life. His mother and older sister, along with his children from his first two marriages, spoke in the interview and were 100 percent supportive. Son Brandon Jenner explained that throughout this process, he “saw a sense of bravery” in his father that, even through all his prior courageous moments, had surpassed anything else. Now, I’ll be the first to say that I had no idea how this interview was going to go, but I’ll also be the first to say that Jenner opened up with complete grace and poise. He discussed his lifelong struggles, touching on every subject from his athletic career, to his relationships, to his family, and promoted his message, hoping to make the world a more accepting place. The world needs to become more educated about the transgender community to recognize that gender and sexuality are two different things. Gender is whom you identify yourself as within, and sexuality is whom you are attracted to. Jenner says his gender is female, but he is attracted to women. That being said, these subjects are not black and white, but rather dozens of gray shades. The concepts of gender, sexuality and the way they intertwine are of the utmost complexity. Therefore, they are all the more important to understand. The transgender community is becoming more and more accepted, and Jenner wants to ensure it remains as such. He leaves us with one thought: be open-minded. He said, “Have an open mind and an open heart. I’m not a bad person. I’m just doing what I have to do.” The way Jenner carried out his message resonated within viewers and is bound to shed some light on the transgender community. Although he has not officially decided to undergo a sexual reassignment surgery — but has been back on female hormones for over a year — the next time he does an interview will be as a woman, his real identity. And the world better be prepared to embrace her.